WHAT: The National Association for Chicana and Chicano Studies (NACCS) Tejas Foco Committee on Mexican American Studies (MAS) Pre-K–12 presents the 3rd Statewide Summit on Mexican American Studies for Texas Schools 2018 (see tentative program schedule below). The MAS Summit is free and open to all educators and community members who are interested in implementing Mexican American Studies in Texas schools. Free breakfast and lunch will be provided for all registrants. Texas teachers will be eligible to receive up to 8 hours of Continuing Education Credit for attending and participating. 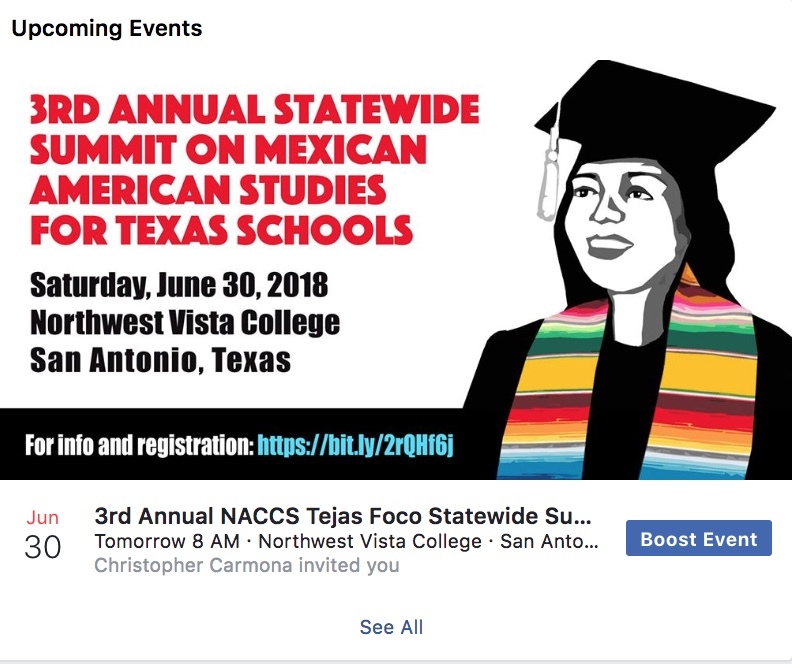 The goals of the Statewide Summit on MAS for Texas Schools 2018 are: to give teachers and administrators tangible information on how to implement MAS in their classrooms and schools; to identify institutional barriers, establish priorities, and develop plans of action for the implementation of Mexican American Studies in Texas schools from Pre-K to 12th grade; and to increase access to MAS courses and content within the broader community. 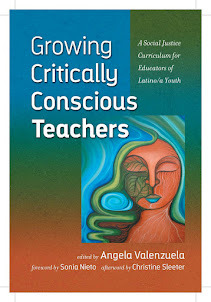 Teachers and experts in the field of Mexican American Studies will facilitate hands-on workshops and breakout sessions on various topics, including: the current state of MAS from Pre-K-12th grade in Texas and the recent historic vote by the Texas State Board of Education to approve a MAS course for high school students; best practices and the development of curriculum, textbooks/instructional materials, teacher training, and other in-school programs for Elementary/Pre-K-5th grade, Middle and High Schools; Community-Based MAS programs; and MAS Political/Media strategies. There is no question that the Latino, mostly Mexican-origin, community, is prolific. However this is not all out of choice, women's choice. For example, cuts to women's health care in the name of ending abortion only make us more so. Family research also shows that family size is correlated with educational attainment. Stated differently, the more education that women get, the fewer children they have. I myself wanted to have more than two children, but getting a Ph.D. and being on the tenure track during this time period when my productive and reproductive years overlapped structured that option out. And of course, more education results in greater resources, knowledge, and opportunities that not only expand women's sense of what is possible in the world beyond motherhood, but provides the means, as well, for controlling the number of births they have. 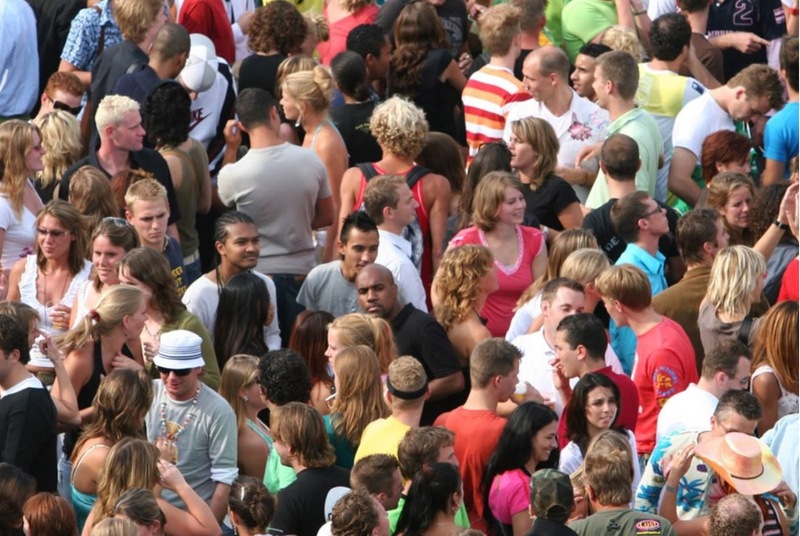 Want to reduce Hispanic population growth? Then educate them and give them the reproductive rights they want and deserve. With growth among the Hispanic population in Texas continuing to easily outpace growth among white Texans, it’s likely the state will reach that demographic milestone as soon as 2022. That’s according to the state demographer and new population estimates released Thursday by the U.S. Census Bureau. The new figures, which account for the state’s population growth through July 2017, reflect the extent to which the white population growth rate pales in comparison to growth among Texans of color since 2010 – a disparity that has set the Hispanic community on its way to becoming a plurality of the state’s population. Hispanics alone have been behind more than half of the state’s growth since 2010. 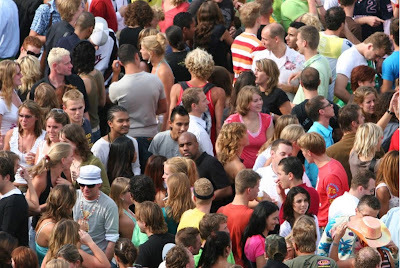 The Hispanic population increased from 9.7 million in 2010 to 11.1 million last year. Meanwhile, the white population has only increased by about 458,000 people. Strikingly, Texas has gained almost four times as many Hispanic residents as white residents since 2010. And the increase in the number of Asian Texans, who make up a tiny share of the total population, has almost caught up with the increase in white Texans in that same time period. The explosive growth among the Hispanic community has been widespread, with population gains occurring in all but a few of the state’s 254 counties. 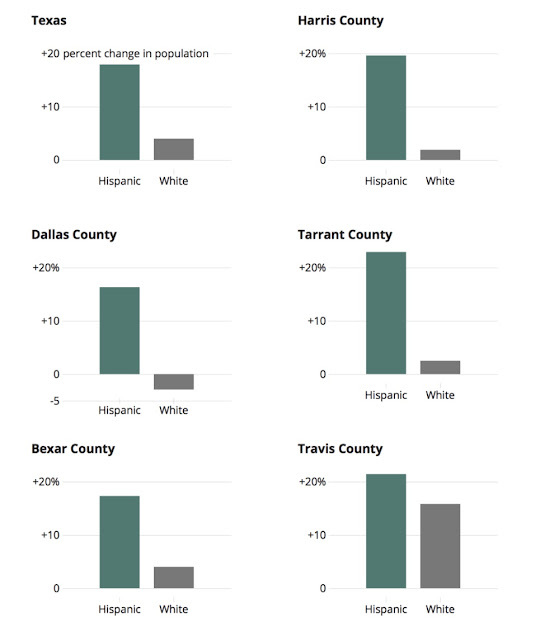 Meanwhile, the white population in neighboring Dallas County is shrinking. Among the state’s five biggest counties, Dallas is the only county where the white population has fallen below 2010 levels. In 2017, Dallas County’s white population dropped to about 764,200 from about 787,150 in 2010. Nationally, Texas held onto its years-long lead as the state that has experienced the largest annual numeric increase of Hispanic residents since 2010. The state also continued to be home to counties with some of the highest shares of Hispanic residents. Starr County in the Rio Grande Valley for years has held onto the top spot in the nation with a population that’s 96.3 percent Hispanic. Donald Trump’s connection to Russia and Russian interests dates back more than 35 years. His family and associates also have well-documented ties. Since it can be challenging to keep track of all the players and moving parts in the ever-growing Russia investigations, lawyer Steven Harper and the producers at BillMoyers.com created this interactive Trump-Russia Timeline. It is a comprehensive, easy-to-navigate tool designed to show what has happened and what still is developing in the story of the president, his inner circle, and a tangled web of Russian oligarchs, hackers, and government officials. First launched in February 2017, the Trump-Russia Timeline now contains more than 1,000 entries. View it in its entirety below, or select one or more names at a time and explore that particular storyline. The timeline is updated regularly as new developments emerge. Do we need to update Godwin's Law about the probability of comparison to Nazis? Excellent read from the creator of Godwin's Law (GL) himself, Mike Godwin. If embryonic of horror, it should be a conversation starter, rather than stopper. We're there. So The short answer is "yes." To this, I would only add that GL is perspectival. Many, if not most, Native peoples are not only generally acutely aware of our own genocidal history and ongoing destructive, scorched-earth campaigns against the environment, but also the epistemologies, dispositions and mindsets that undergird them. Read on. 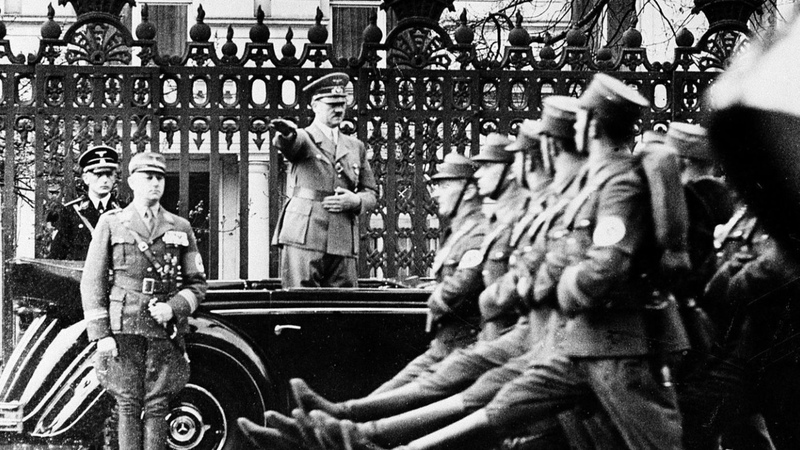 The question of evil, understood historically, is bigger than party politics. Most recently GL has been invoked in response to the Trump administration’s “zero tolerance” border policy that resulted in the traumatic separation of would-be immigrants from their children, many of whom are now warehoused in tent cities or the occasional repurposed Walmart. For example, former CIA and NSA director Michael Hayden — no squishy bleeding heart — posted a couple of tweets on June 16that likened that policy to the Nazis’ treatment of children in Germany’s concentration camps. California Sen. Dianne Feinstein (a Democrat but also a security hawk) has made the comparison as well. Mike Godwin is a distinguished senior fellow at the R Street Institute. He is a former general counsel for the Wikimedia Foundation and was the first employee of the Electronic Frontier Foundation.